The right angle is king of the world. Look around you and everything is square. The streets, the buildings, the windows in the buildings. The TV you watch and the refrigerator you lean into to grab a snack. If there is a single, overarching symbol of civilization, it is its rectilinearity. Honeybees make hexagons; humans make squares. I write this in a square office in my square woodframe home on a suburban block, staring at a rectangular computer monitor, typing in letters on little cubic keys embedded in a rectangular keyboard. The books I consult are square-edged, the file cabinets I keep my research in are boxes. Even the take-out Chinese food I eat at my square desk comes in a plastic foam clamshell cube. We are so inundated with right angles, that I’m afraid we don’t see them anymore. They become like the invisible air we breathe. Yet, if you begin to notice them, they can become oppressive. There is a tyranny of the box. There are reasons, of course, that our built environment relies on the square. Of all shapes, it is the most space-efficient. The dairy industry, for instance, discovered many years ago that square milk bottles took up less space on the delivery truck than the older round bottles. And because they can share walls, square buildings can fill up space just as efficiently as the milk bottles. It becomes like playing dots-and-boxes, connecting the dots to make little sub-squares. 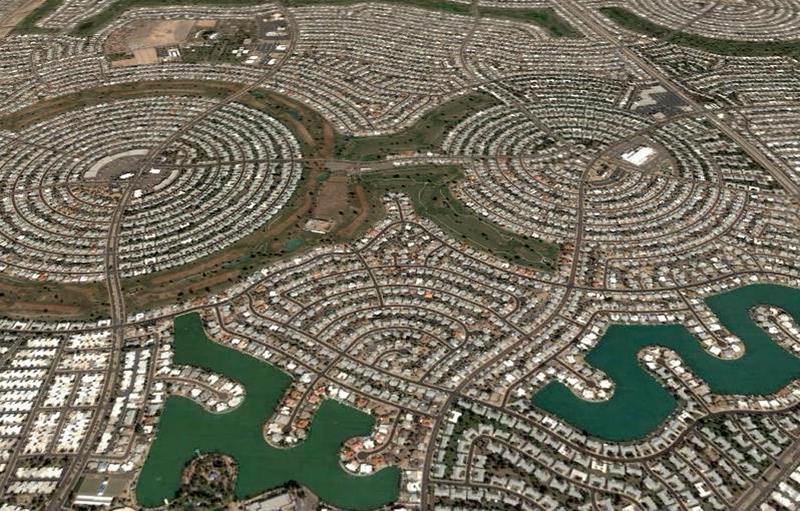 There are attempts to break up the squares: the swirling streets of planned retirement cities, such as Sun City, Ariz., for instance. 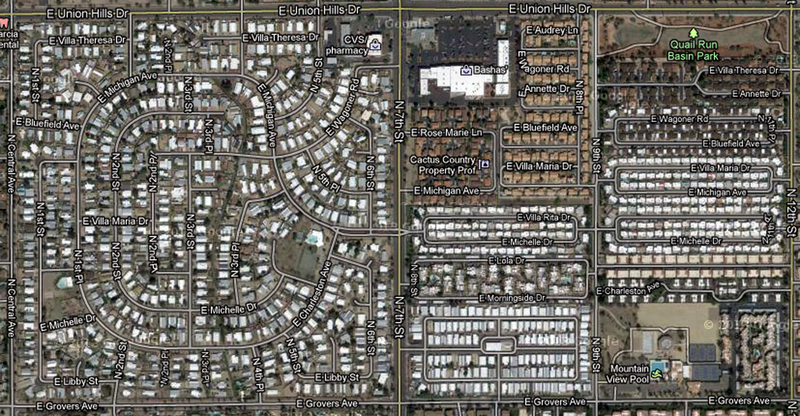 Even in the larger city, new tract housing is often built on curvy streets, but those streets are all contained within the larger squares — the “major cross streets” — of the larger Phoenix metro area. Those mitochondriacal squiggles are almost like the irregular growth of cancer cells inside the regular structure of the urban grid — a virus waiting to bust out and infect the next municipality. What is round is escape: the wheels of our cars, the CDs of our Walkmen, the cylinders of our vodka bottles. 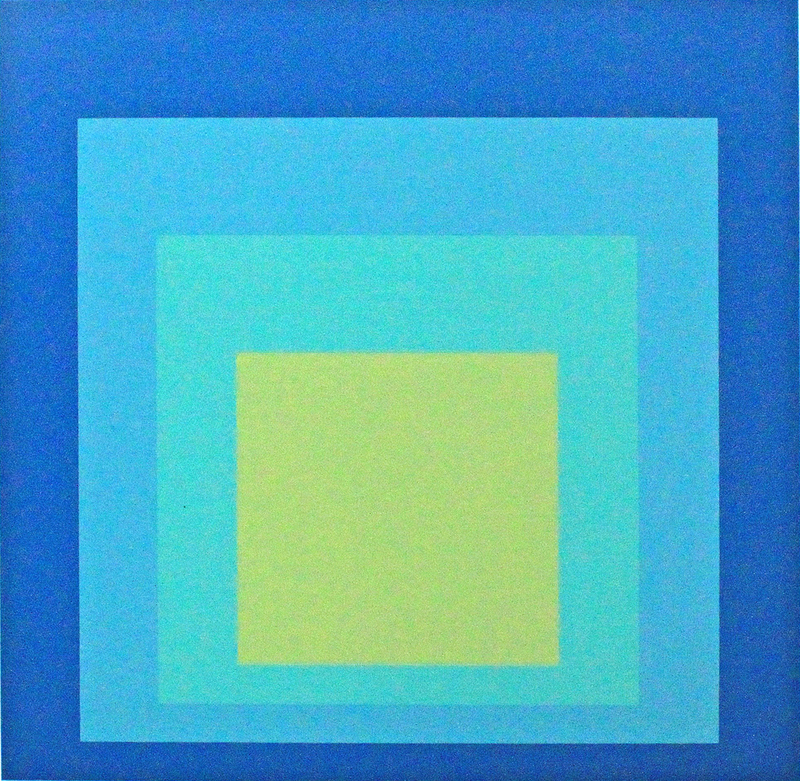 Considering how ubiquitous the square is in the human world, it is striking to discover how rare it is in nature. Certain crystals are square — look at a grain of salt under a magnifying glass — but more common are rhomboids and hexagons. And nature so dislikes the cubic salt crystal, that she dissolves most of them in seawater as if they were collectively the Wicked Witch of the West. In fact, nature seems perpetually at odds with right angles. She wears them down through erosion, attacking the sharp mesa edge or the overhanging rocks of Niagara Falls. Nature grows things asymmetrically, profusely, and just as avidly, breaks them up into chunks and sands them down into dust. You cannot expect humans to match that fecundity or ferocity, so instead, we build safe, boring little squares and put cupboards in the corners. If you look out over any American city, you can see the incessant cubicularity of its architecture, tiny and regular against the larger, organic rising and falling forms of the landscape it occupies and the constant metamorphosis of the amoebic cumulus clouds that break up the shapes with moving shadows. How static the architecture seems.